iDNS Domain Expiration Letter Scam - DO NOT SIGN UP! If you received a domain name expiration notice from Internet Domain Name Services (iDNS), DO NOT SIGN UP with them! It is a scam to get you to pay far more money than you need to for your domain name. This is strictly a marketing letter to entice (scare) you into overpaying. 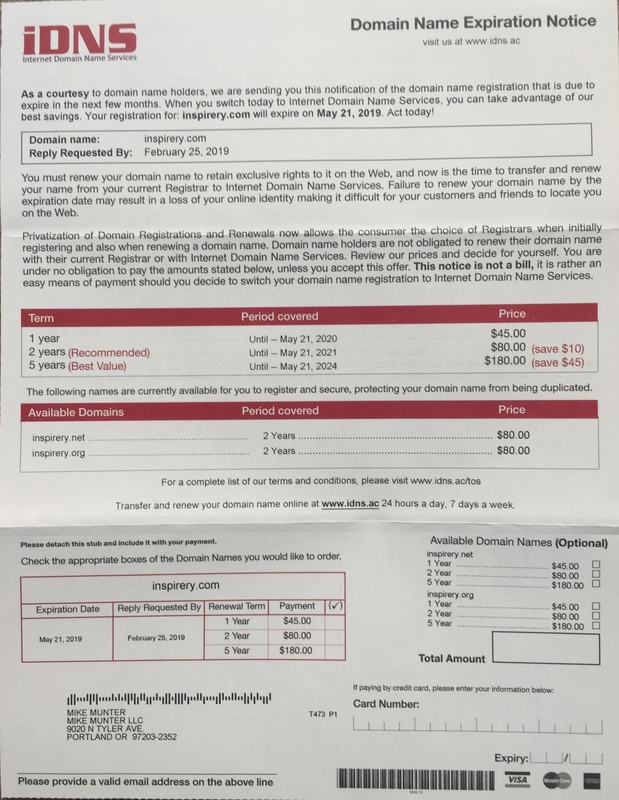 In fact, if you’ve received this letter, it’s because you’re probably already paying GoDaddy, BlueHost, HostGator or another well known registrar. These companies typically charge $10-$15 per year to re-register your domain name. Why would you pay more to renew your domain name? You get no more value no matter who you renew your domain name with. Yes, you DO have to renew it, but why would you pay 2, 3, even 4x as much as you’re already paying? Next, you’ll see in bold. Well, it sure looks like a bill and I bet a lot of people just go along with it, thinking it is a bill. I can’t stress enough – this red and white letter is a deliberate attempt to fool consumers who don’t know the difference. I hope you don’t fall for this letter. It’s a marketing scam and you don’t have to pay them. Renew with your current host – in fact, do like I do and set your domain names to auto-renew – that way you’ll never lose them. Of course, you’ll continue to get iDNS marketing scam letters in the mail when your domains come up for renewal. Do what I do – straight to the recycling bin!